In the latest “drone-umentary” to capture a wide audience of fans online, a bird’s eye view of what appears to be a mother blue whale and her calf along with stunning views of blue ice can be seen captured in various spots of Antarctica. This movie was shot during our 20 days trip to Antarctica in December 2014 to January 2015. We started from Ushuaia in Argentina and went to Port Williams in Chile, rounded Cape Horn and crossed the Drake Passage towards the Melchior Islands in Antarctica. 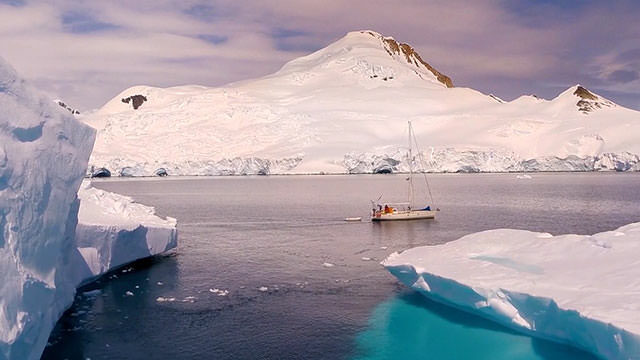 The entire video was apparently recorded using a DJI Phantom 2 quadricopter (drone) and a GoPro HERO3 camera, and includes shots of the crew’s sailboat, a team member standing on an iceberg, and other picturesque views of frigid Antarctic landscapes. Although the trip took place from December 2014 to January 2015, the video was published to Vimeo in April 2015 where it has received an enthusiastic response from other users. Ljung edited the film using Final Cut Pro X. The Melchior Islands are “a group of many low, ice-covered islands lying near the center of Dallmann Bay in the Palmer Archipelago, Antarctica” according to Wikipedia, and were named by French explorers after Vice Admiral Jules Melchior of the French Navy.